Using silent vignettes, music, and sign language, “Sign” uniquely tells the story of a relationship between Ben, a hearing man, and Aaron, who is deaf. 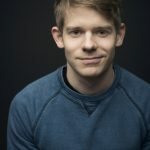 Andrew Keenan-Bolger is an actor, director and bestselling author currently starring as “Jesse Tuck” in Tuck Everlasting on Broadway. Other Broadway: “Crutchie” in Newsies, Mary Poppins, Seussical, Beauty and the Beast. Film/TV: The Rewrite, Marci X, Are You Joking?, “Nurse Jackie”, “Looking,” “Naked Brothers Band,” “One Life to Live.” As a filmmaker, he’s been profiled in The New York Times, The Wall Street Journal, Rolling Stone, Entertainment Weekly, AP and New York Magazine. Co-director of the short films The Ceiling Fan, Sign and critically acclaimed webseries, “Submissions Only.” Co-author of the book series Jack & Louisa (Penguin Random House).